Intermittent motion is a traditional and most used technology in the market today. Because of the simplicity, versatility and advanced packaging capabilities of the intermittent motion, it is the preferred option in many applications. IMT-250 Twinseries machines by using Servo-Motion Technology reaches the maximum speed that intermitted motion technology could achieve. 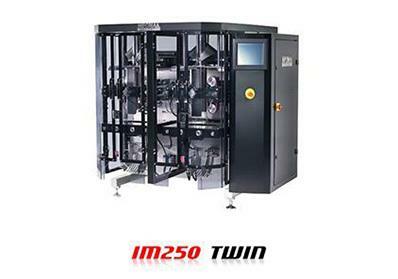 The modular design of TWO-IN-ONE IMT-250 TwinMachine resulted in Ease of operation,Minimal maintenance,Quick changeover and setup, reduced operating cost, require one personnel, twice the production in same space as a single tube machine and the most attractive benefit is Ability of packing two different weighs at the same time. Ability of packing two different weighs at the same time. 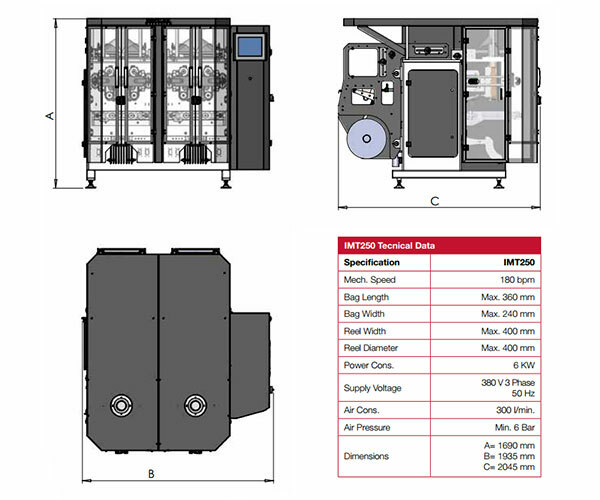 Mechanical Speeds up to 90 Bag/Minute per side. Adaptable for different filling systems such as; Volumetric weigher ,Linear weigher , Multi-head weigher , Auger filler , Piston filler etc. Adaptable for different sealing systems such as; easy-open bag, euro-slot bag, round hole bag, straight cut, tear notch cut, and zig-zag cut.